Some simple things that other countries do seem so obviously intelligent, you have to wonder why your own country can’t manage it. The distribution of milk – delicious, same-day, unpasteurized, farm-fresh milk – in many parts of Italy is one such example. The very fact that citizens are allowed (gasp!) to drink unpasteurized milk is itself a triumph of intelligence. In Canada, despite the fact that today’s bovine hygienic standards take the risk out of the stuff, pure milk is still seen as kryptonite to our species. So imagine my delight on seeing two machines that give me what I want, at any hour of the day or night. Milk bliss. 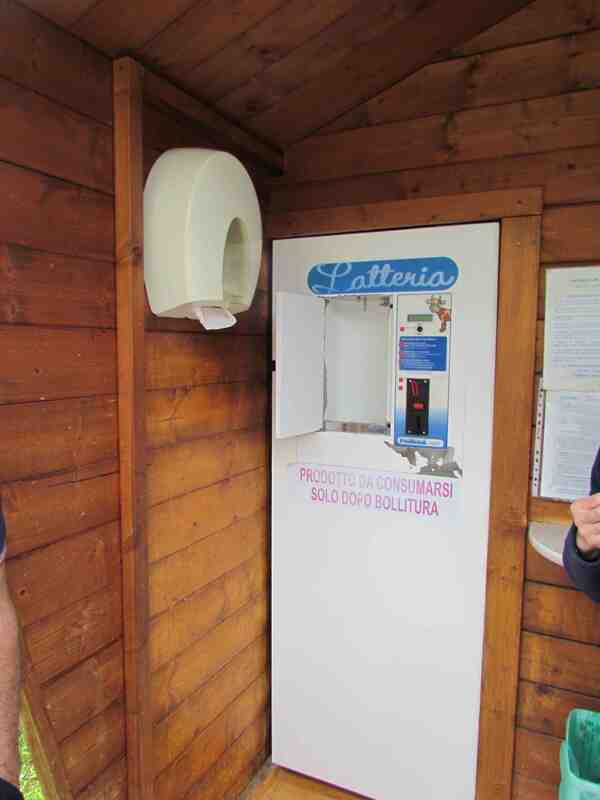 A little rain-proof kiosk with bottles to the right and the Marvelous Machine. The pink warning says you’re not supposed to drink it until after you’ve boiled it – a health precaution that also (according to comments on this blog) keeps the milk for longer. Marvelous Machine in action. We saw this on a Sapore e Sapere tour. 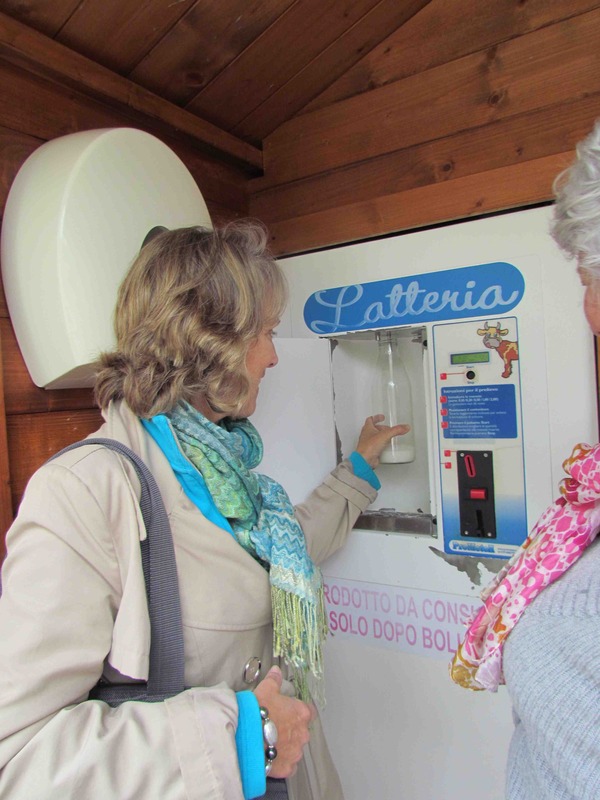 The first, in Tuscany, allows you to bring your own bottle, or purchase one at the vending station, and purchase however much fresh milk you want from a spigot. Good Lord. Not only is it pure, but if you only want enough for your coffee that morning, that’s OK. The farmers fill it up each morning and evening. If it runs out, there’s a number to call – it’s the farmer, who will drive down and refill it if he has any left. In Varese, you can buy the unpasteurized local milk at the grocery store. I don’t drink any other kind when I’m there and I’m still not suffering from kryptonite poisoning, imagine that! 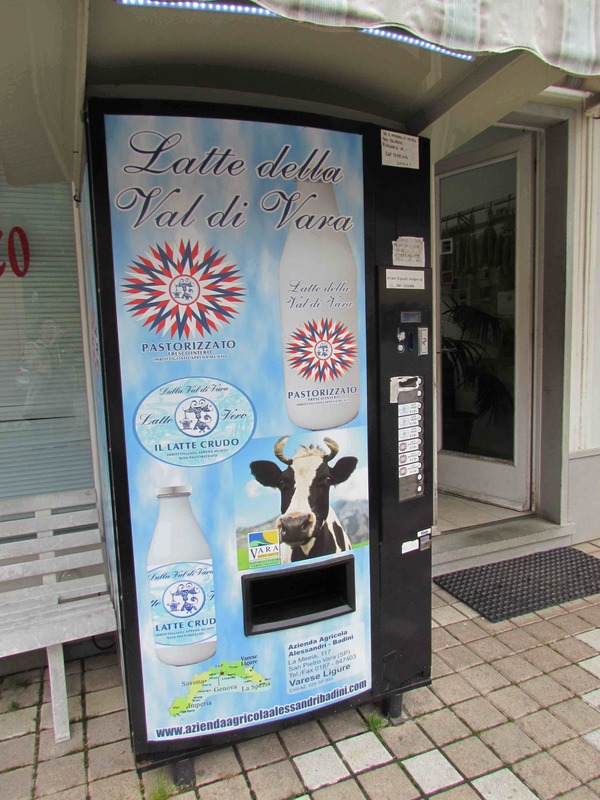 On my last visit I discovered the milk vending machine, in front of the organic meat butcher in Varese Ligure. It’s not quite as exciting as the Tuscan spigot because you have to buy a whole 1/2 litre bottle, but it’s still pretty cool. Store closed? No problem. Pop in your coins and out pops a bottle of fresh, pure milk, just like a can of Coke, except so much more worth drinking. Varese Ligure’s midnight milk vendor. You can buy the pasteurized version here too (as well as the ‘crudo’), but why would you? We were like little kids with a bubble gum machine using this thing. Ridiculously delighted. Heavens, how did this pic get into the milk post? Another form of bliss: the locally brewed grappa, nicely packaged for export. That’s another thing we’d never be able to do in Canada. I liked your explanation too….and I would not boil the milk. Thanks for this post-what a wonderful day it was and I love seeing my friend Laurie in your photo! It was a lot of fun, and a real eye-opener regarding pure food versus the stuff we usually eat. The food artisans are also under fire from the inexorable bureaucracy, apparently – what a shame – but many are still managing to find ways to survive, thank goodness. I’m so glad introducing you to my ‘mechanical cow’ has given you such pleasure. It’s a favourite stop on my tours. Debra is right about ‘bollitura’ meaning boiling. These signs appeared after the big industrial dairies tried to close down the raw milk machines claiming a health risk for which there was zero evidence. The farmers have a biochemical lab in their milking parlours and test the milk every day. There are also frequent surprise inspections by the health and safety people. It’s a wonderful example of what we call ‘filiera corta’, short line of supply from producer to consumer where your money goes straight to the producer keeping him and his family in business — the equivalent of a milk farmers’ market. By the way, there’s now one dairy farmer at the farmers’ market in Santa Barbara, California, who has jumped through enough hoops to be allowed to sell his unpasteurised milk to the public. Hooray! We have a dairy farmer near Toronto who has been waging a battle (and so far losing) to continue to sell his farm-fresh milk to all the people who have been buying it from him for years without getting sick. I understand the need to protect the public, but surely it’s possible to test rather than condemn. By the way, I also updated a caption to mention it was on your tour that we discovered the machine – I should have done that in the first place. 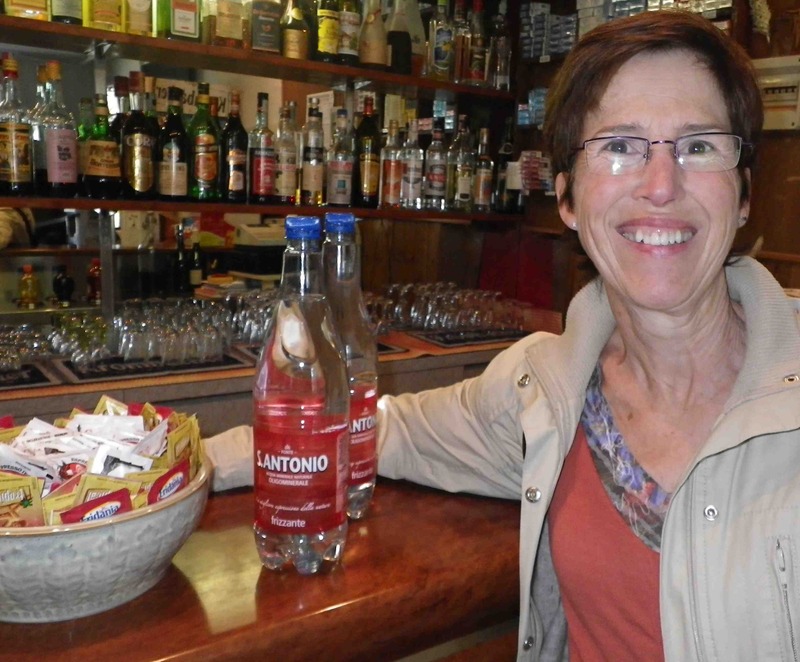 Thanks for mentioning my Sapori e Saperi Adventures tours, Shelagh. I wonder whether it would help the dairy farmer to be in touch with the Californian one who won his battle. If I come across the information about him I’ll send it to you. Also, there’s an association in Wisconsin fighting the battle: http://www.raw-milk-facts.com/. And this site on the subject is fascinating: http://www.raw-milk-facts.com/. Your farmer probably knows all about it, but I’ve just been hooked reading it for half an hour. Yes I found this too. Our farmer actually has quite a movement behind him at this point. I’m glad to hear your farmer has lots of local support. Everyone should get on the bandwagon in support of reason and commonsense and the freedom to drink milk that tastes good. We have had these machines in Spain for more than 3 years now. And I agree with Debra, the warning means that it should be boiled before using it. This is for hygienic reasons and also because the milk will keep better if it boils first. Guess I will have to change my caption…even though I loved the idea of it the way I misinterpreted it. The trouble with boiling raw milk is that it tastes like, well, like boiled milk. Do you really like the flavour of boiled milk? The raw milk from the mechanical cow tastes like fresh milk and lasts for 7 days in my fridge. The good thing about raw milk is that when it goes ‘off’, it’s clearly sour and solid, and some people like it. The white water that passes for milk from industrial dairies doesn’t goes off in a recognisable way, so you could drink something bad. Bollitura means boiling….perhaps they have to say that to cover themselves. I grew up drinking unpasteurised milk. Mum used to buy it direct from a farm and it was delivered in a bucket. She also bought cream that had to be spooned out of the bowl. When my son was young we lived on a dairy farm and had milk straight from the cow. We managed to survive.